Mummy has been busy all the evening preparing a special dish for dinner. She has recently attended a friend’s party and got this recipe of a mouth-watering Italian dish from her hostess. Although she is feeling tired, she is looking forward to an excited response from her family, who she expects will praise her culinary art after enjoying the delicious dish. Dinner is laid out and everyone is called to the table. But what happens is disappointing for the mother who has toiled a good part of the evening preparing it! Daddy is busy on the computer and requests for his plate to be brought to him saying, “I have to reply urgently to an important e-mail and can not leave the computer. You never know when we will have a power breakdown”. The eldest son comes out of his room, and hurriedly piles the pasta and the gravy on his plate, pours the sauces and heads back to his room. Mummy protests, “Where are you going”? He replies, “Mummy I have to give a presentation in University tomorrow, and my friend has come to help me, so I will have dinner in my room”. The daughter is watching her favourite soap on the TV. “Mummy can I take my plate to the TV lounge”, she announces more than she seeks permission, and off she goes too from the dining table with her share of the meal. After the long and tiring preparation of the special dish, a frustrated Mummy is left on the table with her youngest one. She eyes him musing thoughtfully, “Maybe in a couple of years he too would find activities more interesting than the family get together at dinner”. This is a normal scenario in nearly every household. Dinner time was once considered the most important time of the day, when the family got together each night. It was the time to rebond, relax, communicate and build a stronger and healthier relationship with each other, and the members actually looked forward to it, considering it the ‘prime time’ of the day. Jokes were cracked, memories were shared and favourite family anecdotes told and retold. Many times small problems were discussed and solved. Children learnt table manners from their elders. They also learnt to share responsibilities, as they helped out Mummy in laying the table and clearing it up. The elder ones took turns at washing or drying dishes. It was the time to care and share. But gradually all of us have become too busy in our personal activities to enjoy this family get together any more. We consider it a waste of time because we usually take a longer time at the table when we are having dinner together and we can hardly afford this extra time more than once or twice during the whole week. The trend of running back to whatever we were doing before dinner was laid out, with our plates loaded with food, is a very unhealthy trend for family life. During the days we all have to follow our own routines. Daddy is busy with his job (or business) and the children have to attend their educational institutions, and most of them come home at different times. Mummy is busy in her daily household chores, and if she is a working mother, she has to manage her job as well. Having lunch at the same time is not possible. Every one of us takes his/her meal according to his/her own convenience. Dinner is the time to be together, when, at the end of the day, all of us should suspend our personal activities and carve out an hour which is only meant for the family. While sharing a meal we are usually talking to each other, thus relaxing and building a better communication. The main advantage of having dinner together is that we all remain in touch, have knowledge of each other’s activities and problems, seek support and give out friendly advice to our family members. It gives us a chance to share our views on current issues and receive encouragement on our achievements. Dinner time is also the best time for making plans for up coming family events or for the weekends. It is also the time to share the events of the day, news and ideas and best of all, just to be together and enjoy each other’s company. So, whether Mummy cooks something special for dinner, or it is just the good old Aloo Gosht for the main course, be sure to make dinner time the ‘Prime Time’ of the day. “What do you have for breakfast?” Raheel asked. “Now I know what your problem is! After a gap of eight to 10 hours since your last meal, your body is starved for energy and so you cannot concentrate on your lessons. Just make it your routine to wake up earlier and have a healthy breakfast before you come to school. In a few days you will know the difference!” Raheel tried to convince his friend. Like Junaid, most of you school-going children want to skip breakfast, not realising that a healthy morning meal plays a vital role in your physical and mental development as well as your ability to learn. In the morning, there is roughly an interval of 10 to 12 hours since the last meal and the body craves for food. But because you are still feeling sleepy, or are in a haste to reach school in time, some of you overlook your body’s requirements and convince mum that taking a snack for the school recess is a good alternative to breakfast. Usually mothers are very particular about their school-going children’s sleeping hours. They realise the importance of a good night’s sleep for better performance at school. But sometimes they can overlook the importance of a good and balanced diet, especially breakfast. Making sleepy and grumpy children eat their morning meal may be tiresome and time consuming, but if this healthy habit is developed from an early stage of life, children actually learn to enjoy their breakfast. Friends, you are going through a stage of life when both your mind and body are growing. Doctors and nutritionists strongly recommend a wholesome meal in the morning. A few more minutes of sleep is not worth skipping your breakfast for, as you must realise that the time spent having breakfast is much more beneficial than the extra sleep. Your energy level is low in the morning and your brain and body need to be recharged so that you are efficient at whatever you do during the day. You need a nutritious meal after you get up, so that you are more active and attentive at school. You must understand that breakfast is the most important meal of the day and what you eat in the morning greatly influences your performance the whole day ahead. According to the American Dietetic Association, children who eat breakfast perform better in the classroom and on the playground, with better concentration, problem-solving skills and eye-hand coordination. 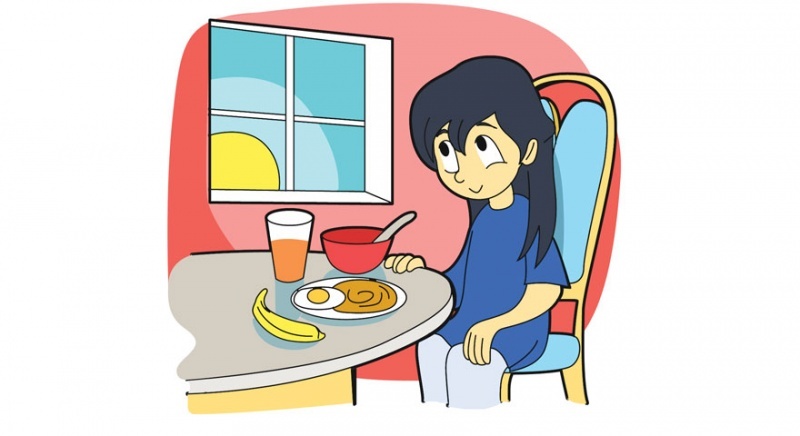 Many other studies have proven without doubt that children who have a wholesome meal in the morning perform better in their studies than their peers who skip breakfast. They are more attentive in class and can concentrate on the lessons in a better way. A cheerful disposition and good social behaviour is also linked to a healthy start of the day! On the contrary children who come to school without eating a proper morning meal complain of laziness, lack of concentration and usually have an irritable disposition. Some overweight adults and children have the wrong notion that they will lose their extra weight if they do not have breakfast. But they do not know that when our body is famished, we often tend to overeat when we take our next meal, or in between meals we munch on snacks like chips and cookies, which are high in calories (but of little nutritional value), and in this manner put on pounds instead of losing them. The correct rule is to have a morning meal which will keep you healthy and not add to your obesity. Fresh fruits, cereals, boiled egg, bran bread and a glass of skimmed milk can be a perfect morning meal for a person who wants to lose weight. On the contrary, those of you who are underweight can have fried egg, whole wheat bread, butter, full cream milk, cheese and fruits. Friends, ask your mother to suggest a breakfast menu which is rich in whole grains, fibre, carbohydrates, vitamins and proteins. Before you go to bed, decide what you want for breakfast in the morning so that your mother can prepare it without any hassle. For her convenience, you can also make a weekly menu and put it up on the refrigerator or any other prominent place in the kitchen. You have a vast choice of healthy foods ranging from seasonal fruits, cereals, whole wheat bread, eggs, honey and milk or milk products i.e. cheese, yoghurt, butter, etc. The nutrients your body gets from these will keep you alert, attentive and agile in school. Avoid rich foods like cakes, pastries or paratha, halwa puri, etc., as these foods are high in calories but of little nutrient value and will only make you feel lazy, sleepy and dull, instead of giving your body the nutrients it requires to grow. Canned fruits or juices are not healthy as they have added preservatives and food colours, so avoid these too. Give yourself a healthy start every morning! Not only will you get all the nutrients required for your growing body, developing brain and a normal and balanced weight, you will find a remarkable improvement in your performance at studies and sports and it will also make you a cheerful person who is popular among all! Nothing much to brag about but… Sigh! This is what I managed in 2013.. maybe I would do better next year! !